Corrugated metal fencing can be used in a variety of ways, ranging from adding a different touch to your garden border to enclosing your yard in style. Strong, rustproof and lightweight, corrugated metal fencing has slowly become popular in landscaping plans, especially for those who want an environmentally friendly option. The costs of corrugated metal fencing will greatly depend on the costs of the fencing material, the scope of the job, your geographical region and the contractor you choose. 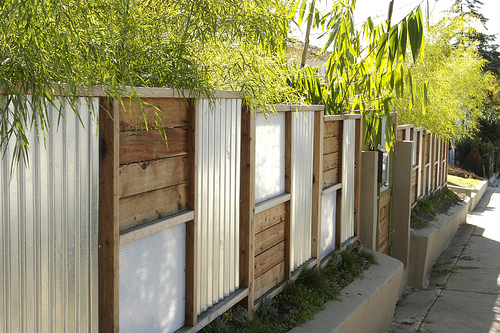 From the costs we researched online, the prices for just the corrugated metal fencing sheets, depending on the height and quality, can range anywhere from $7 to $15 per 12-foot long sheet, whereas the labor costs, again, based on the factors mentioned prior, could cost another $5 to $7 per square foot. Factoring in both the materials and labor, it’s best to budget $4 to $8+ per foot. All jobs are going to greatly vary and it can be hard to offer an exact estimate, and for that very reason, we highly recommend you check out HomeAdvisor.com, a free contractor quote comparison tool that allows you to explain your job and have contractors contact you with a quote for the job. It’s free, it’s easy to use and no credit card is required to obtain quotes from licensed contractors in your area. To put it simply, corrugated metal is a piece of sheet metal which have been formed into ridges and valleys to help it drain water off its surface. Coated in zinc or a mix of zinc, depending on the brand you choose, corrugated metal fencing can be made from either corrugated galvanized iron, galvanized steel, or in some cases, it could be made from other metals such as aluminum or copper. These properties allow it to be affordable, lightweight, recyclable and resistant to extreme weather conditions. Aside from fencing, corrugated metal can also be used for roofing, siding or any flat panel application which calls for a panel such as a privacy screen. Most sheets will range from 8, 10 and 12 feet in length, often 26 inches wide. Your results, however, can greatly vary depending on where you purchase it from. Houzz recommends that you use galvanized bolts or screws to prevent rust when the metal is attached to other materials. Always consider framing the edges so it is out of reach of any pets and children. This type of fencing can come into contact with the ground without the worry of rotting. Because of this, it can make a great choice for not only fencing but for raised gardening beds as well. For gardening beds, the panels can evenly heat the soil and reflect the sunlight, allowing warm-season crops to have a higher yield.